Evelyn Hartshon | The Ego Co.
Evelyn Hartshon, The Costume Ball, The Ego. Co. The Costume Ball has started! TP to the Ball. In this post I have one item from The Costume Ball to show you and also one from FAIR. This skin is called Alyx and it is the next line of skins from Pink Fuel. This is one of the Femme Fatale skins from The Costume Ball. There are two available, the second is Kumi in a dark tone. The dress/ jacket is from Essences at FAIR. There are 5 different colours to choose from. I really like this dress/jacket, the only thing that bugs me is the invisible inside, it doesn’t work that well in photos. If I wasn’t using it as a main feature of the post, I would have edited it to hide the invisible sleeve. Dress | Melissa Jacket Red | Essences | Inka Mexicola | Mesh | FAIR. Here’s some stuff from the Resting Place Halloween event at sn@tch, the new round of FAIR and The Costume Ball (starts on 24th October). Promo info about Resting Place. I haven’t been yet, it doesn’t end until the 18th November, so you guys have ages to go! ‘Coming this Halloween from the creators of Cutting Class, Nightmare Eden DIVE & The Flesh Game, one of the most frightening and realistic fear experiences you will have in Second Life. I’ll give you more into about The Costume Ball closer till it starts. It’s the second week of Raid Your Closet! This week I’ve gone for a punky type look – black leather trousers & jacket, tons of necklaces, big worn down boots and a hat. These items all range from 2009 to 2012. Some items might not be available anymore. Hi. It’s been a few days since my last post. Soz about that. I have news. I’m going on holiday for a week to Scotland. \o/ I leave on the 13th September and return on the 19th September. My dad moved to Isle of Arran month or so ago. I’m super excited but there’s NOTHING to do on the island! There’s a beach and lots of walks over hills and stuff. *Hopefully* the weather will be nice but I’m not counting on it. Probably won’t be swimming in the sea but I hope to see some otters. I’ll take photos and put them on my Flickr. Anyway, there’s me rambling on about a holiday when I have stuff to show you! First is this new top from C’est la vie. This was released yesterday. It’s rigged mesh and comes in sizes L,M,S,XS and XXS. I don’t know if these are based on the official Standard Sizing. 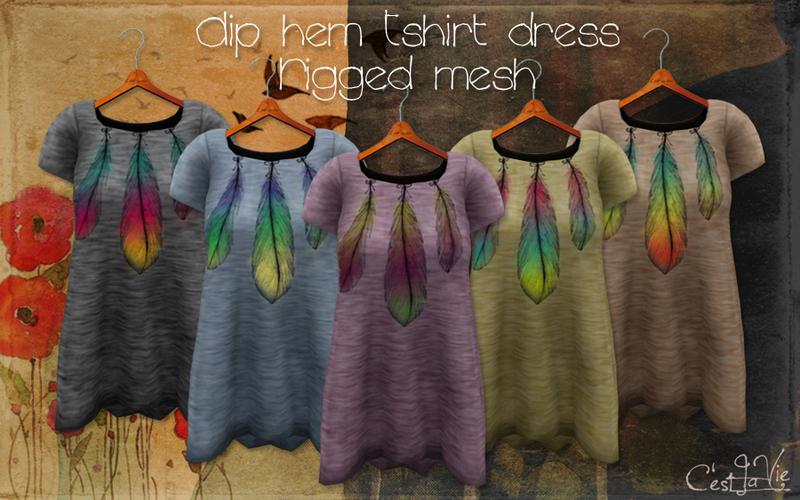 There are 5 different colours to choose from and they all have this gorgeous multicoloured feather design on the front. See the colour options here. I may have to go back because I want them all! The trousers are from evolve for The Summer Harvest Hunt, along with the shoes from Elate, also in The Summer Harvest Hunt. The bag is from the new store Auxiliary, this version was a group gift and you can pick it up at the Aura mainstore. The group is free, but I think there will be fee when they officially open Auxiliary. The bracelets and earrings are also Auxiliary and you can buy them at the current round of Fameshed. Today is Truth Hawks birthday. You know who he is right? No? Truth Hawks owns the fabulous hair store Truth. You must know the store since you’re a blog reader? 😛 His wifey, Kaelyn Alecto, thought of this great birthday gift idea for him, she wanted something more fun than a party, so she came up with the idea of taking pictures of his closest friends wearing his hairs. What started as a small gift turned into one GIANT one. Kaelyn has spent over a week taking pictures of 140 different people wearing his hairs! You can see them on her Flickr. Kudos to her dedication and hard work, I hope Truth cries with happiness when he sees it! In other news, The Summer Harvest Hunt has started. The top, shorts, bikini and jewellery are all gifts from the hunt. Sorry for my lack of posts over the last few days. My store is moving, my club (well the club I manage) is moving and the sim is being revamped. It’s all go in sl. I’m taking a little break to show you some stuff from The Summer Harvest hunt that starts on September 1st. There are lots of late summer/ autumn gifts, lots of clothes, furniture, accessories and some poses/ props. There are a lot of mesh gifts too, in fact, over half the clothing items are mesh. I’m showing you three items from the hunt, the top from Sleeping Koala, the jeans from Vero Modero (that don’t include prim cuffs) and the bag from Tea Time. I love this bag. Evelyn Hartshon, Fluid, The Ego. Co.
Hi guys! Sorry for my absence! My SL has been a tad bit busy! Most things are sorted/ work in progress, which means I can sneak in a bit of blogging this weekend. I have so much to show you! Some new events have started. First event is Fluid, it’s a bi- weekly, themed event for poses, animations, props and furniture. It’s an event organised by the Ego Co. team (more info of their blog). Another event that has started is the RMK Gothic SIM Bridal Fair. This is an event I hadn’t heard of until I saw the poster at another store. This event features a bunch of stores that have created some gorgeous bridal wear, including jewellery, gowns, makeup and mens outfits. SGB Summer Festa 2012 has also just started. Sounds Gravis Beach has had Festas before (there was a Halloween one last year) and there’s also a club \o/ I have items from all those events, check the credits to see what’s from where! Evelyn Hartshon, Mesh Around, The Ego. Co.